Growing up in a medical household I was surrounded by discussions, most often at the dinner table, that focused on the human body: its diseases, symptoms, diagnosis, and treatments. In my family of scientists those conversations continue to this day, and the profound effect that exposure has had on my art continues. Although my interest in the body and body politics originated in my childhood, it was during graduate school that this fascination morphed with my art. In an effort to overcome both fear and ignorance of my own body, I began to study gynecology as a gender-specific metaphor. My research focuses on our eternal fascination with the human reproductive system and challenges perceptions of female anatomy. Although most scholars respond to their investigations through writing, as a visual artist, the results of my critical analysis are expressed in works of art. I create objects and installations that give insight into societal attitudes about the female reproductive system and question taboos surrounding sexuality. I have studied collections of instruments, anatomical models, historical texts, and anatomy theaters throughout Europe and the United States. One outcome of this research is a series of so-called “obstetrical phantoms,” or birthing models. These models were, and still are, created for students to practice procedures, including labor and delivery techniques. Another extension of my inquiry includes “sacred anatomy,” the pre-16th century practice of dismembering cadavers, particularly nobility and saints, in order to disperse the remains for widespread worship. Of particular significance to my work is the context where anatomy is studied; anatomical and surgical theaters. During the anatomical Renaissance, the practice of instructional dissection became the preferred method for the study of human anatomy. However, because of preservation issues and theological disapproval, dissections were a rare significant event. 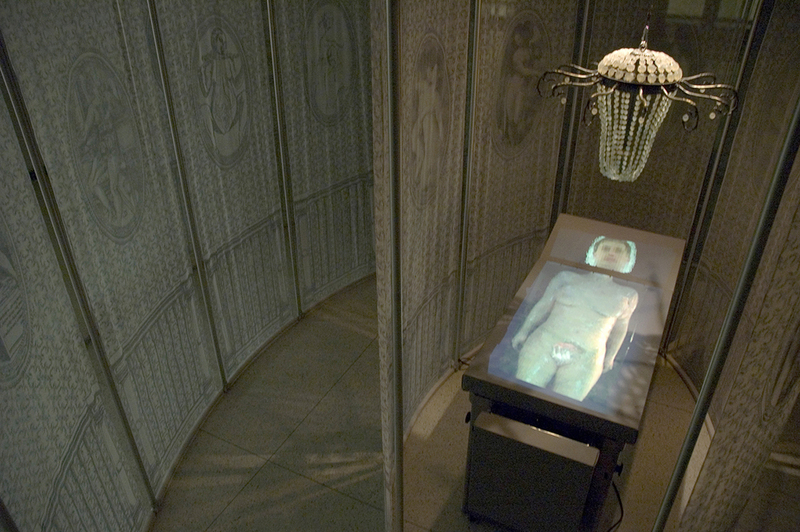 To accommodate viewers, an architectural environment was designed specifically for dissection thus allowing the largest number of students the opportunity to observe the procedures. Such rooms were typically round, with the corpse placed in the center, surrounded by ascending concentric tiers of seats. The architecture of an anatomy theater creates a power relationship between the inhabitants of this space depending on their roles and locations in the theater. When in an anatomy theater, one has a heightened awareness of inequality among the occupants, and one’s role as “viewer” or “viewed” comes into question. I critically analyze this research by creating architectural environments, such as Teatro Anatomico and Coronal Plane that metaphorically reference aspects of the body – when entering a room, the viewer enters the body and their role as spectator shifts to that of the spectacle. My conceptual investigations of medicine and history are integral to my process and stem from my childhood. As a sculptor, I am rooted in the tradition of object making, but I strongly believe these objects have less impact outside of their intended installation context. I enjoy the challenges posed by working in such extreme scales and am convinced this variety stimulates both my studio practice and my creative drive. My work actively explores this contrast in scale, coupled with an effort to bring awareness to my viewers of their physicality, their sexuality, and all its implications. Cristin Millett is an artist who creates objects and installations that represent an intersection of scientific ideas and contemporary aesthetic observations. Her work has been widely exhibited both nationally and internationally in solo and group shows, including at the Villa Strozzi in Florence, the International Museum of Surgical Science in Chicago, and the Exploratorium in San Francisco. 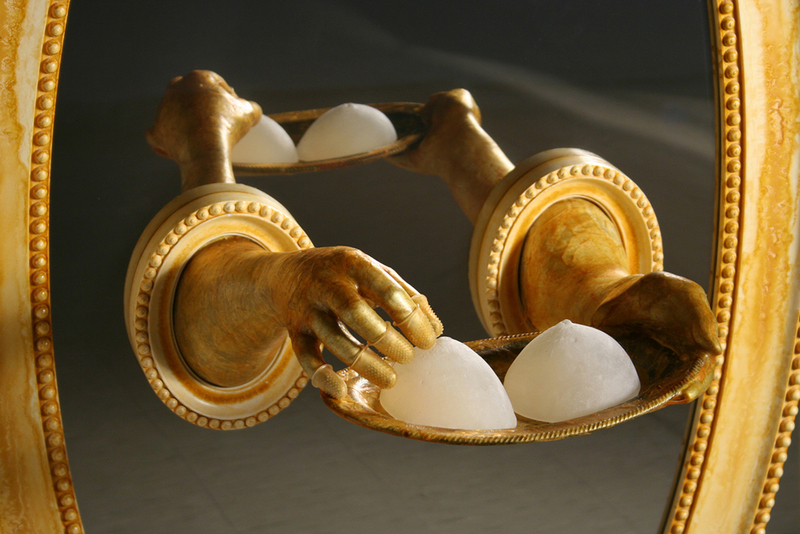 Millett’s work has been positively reviewed in Sculpture magazine, Art Papers, and the Chicago Tribune, among others. A Djerassi Residency in Woodside, California, funded her examination of historical and contemporary societal perceptions of human anatomy. As a resident at Sculpture Space in Utica, New York, she worked for three months to create Teatro Anatomico, an installation based on her extensive research on anatomy theaters. Teatro Anatomico examines the gendered power relationships created among the inhabitants of the space depending on their roles and locations within the installation. In 2015, Millett was awarded a residency at the Digital Stone Project in Gramalazzo, Italy where she used a 7-axis robotic arm to carve Transection of the Anatomical Planes. Rooted in the rich history of medicine in Italy, Transection of the Anatomical Planes is a marble dissecting table incised along the three anatomical planes: the coronal, the sagittal, and the transverse. The slab normally supporting a prone cadaver is instead a vacant void, a sunken cavity suggesting emptiness and loss. The piece references the tradition of ecorché models as well as contemporary modes of imaging the body, such as the Visible Human Project. Millett was invited to return to the Digital Stone Project in 2016 to create Visible Phantom, an obstetrical phantom, or birthing model, that capitalizes on the translucency of marble to suggest the sensual quality of skin. She worked with engineers and technicians at the Garfagnana Innovazione to develop a three-dimensional computer model of her concept using new advances in 3D modeling software and robotic CNC technology. Using the latest innovations in digital stone fabrication technologies, Millett’s sculpture was carved in marble using a 7-axis robotic arm and then finished by hand. Visible Phantom was exhibited at the Sala Ex Marmi in Pietrasanta, Italy. Once the sculpture returns to the United States, she plans to project digital imagery captured through medical imaging techniques onto the smooth ovoid surface. Millett discovered her passion for art at an early age and began her professional studies while attending the University of North Carolina School of the Arts in Winston-Salem for her high school degree. She continued her education at Kent State University, earning a Bachelor of Fine Arts degree in 1990. Upon finding her true direction as a sculptor, she completed her Master of Fine Arts degree in 1996 at Arizona State University. Millett is an Embedded Faculty Researcher in the Arts and Design Research Incubator in the College of Arts and Architecture at The Pennsylvania State University. She teaches undergraduate and graduate courses in sculpture, foundry and installation and serves as the Studio Graduate Program Coordinator.